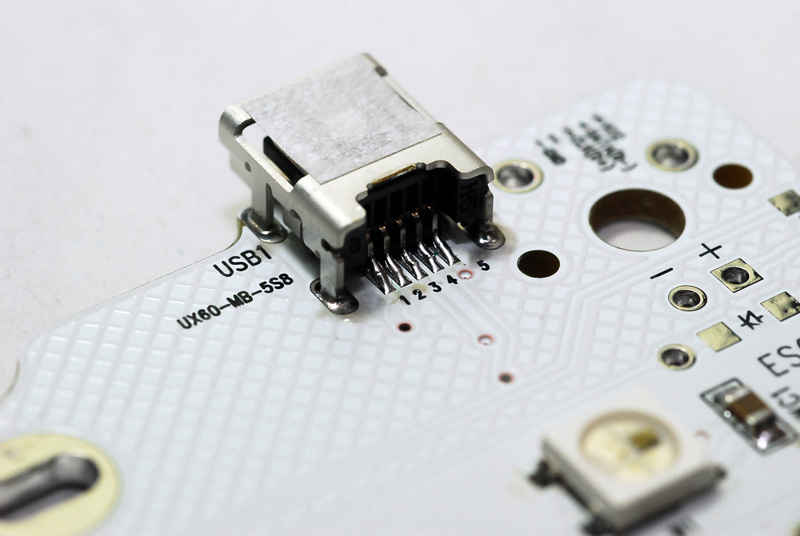 In B.pad, controller parts are only for USB only. 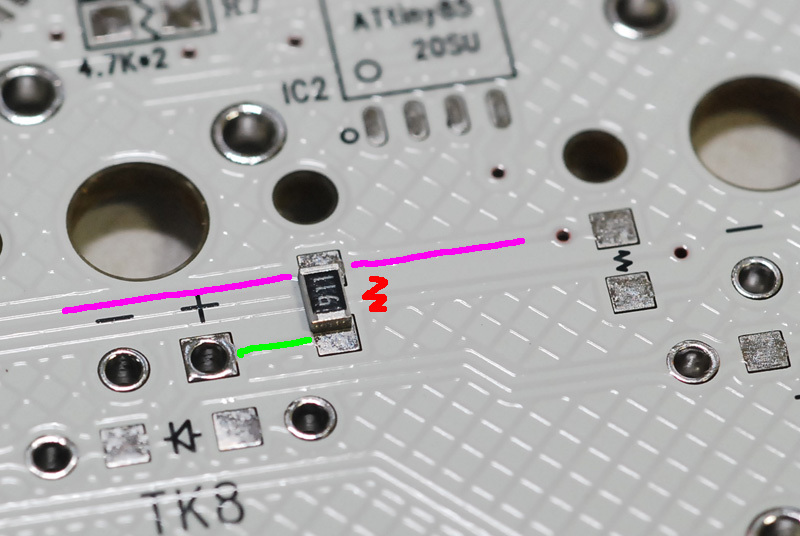 If you want PS/2 connector, don’t solder ZD1, ZD2. But when you connect through PS/2, you can’t use BootMapper Client tool. 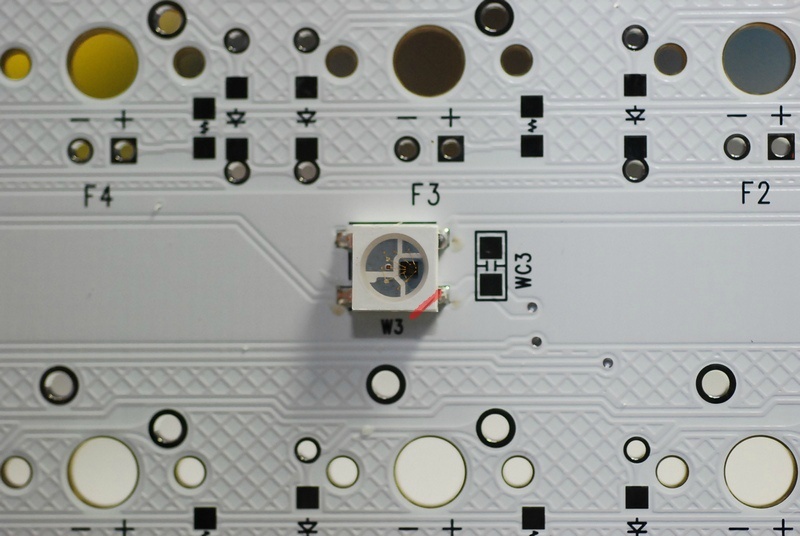 Resistors for controller parts shoud be soldered like the pic above. There is no direction for the resistor. Number on a resistor means resistor’s value. 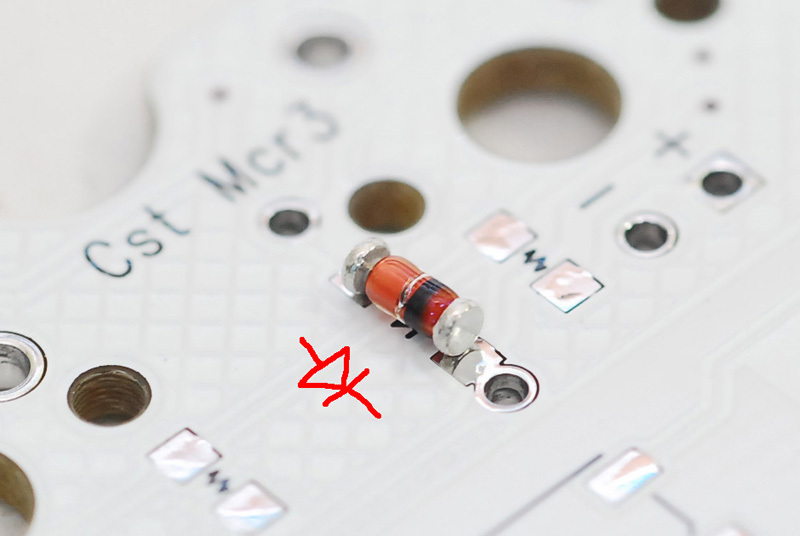 Capacitor “C2” has the directions, so solder it like the pics. And other parts are going same way as the pics. You have to keep in mind that C1 is dark brown and C3/4 are light gray. Crystal(Y1) has no direction, but avoid upside down. 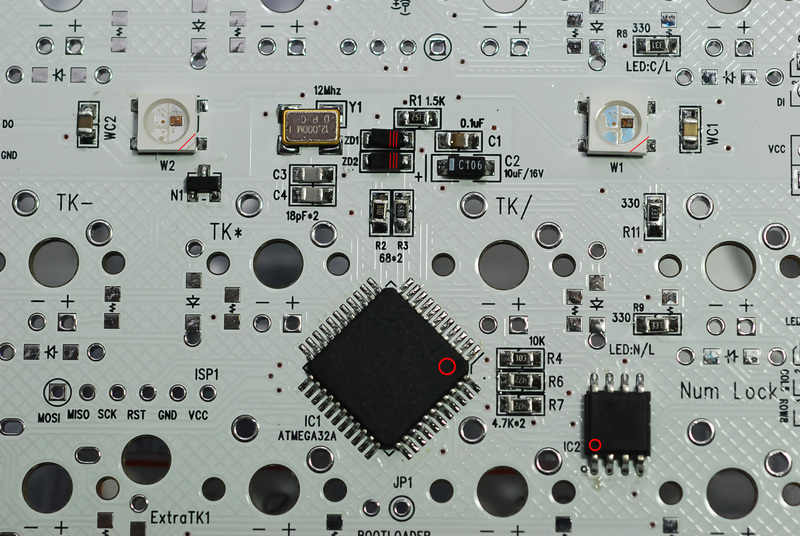 Transistors (N1~3) are going like the pics. 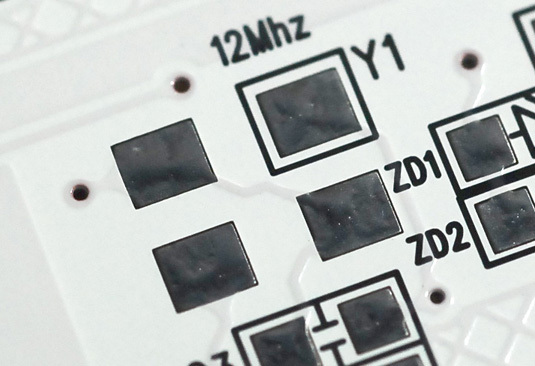 Zenodiode(ZD1~2) has the direction. Please refer to the pics. 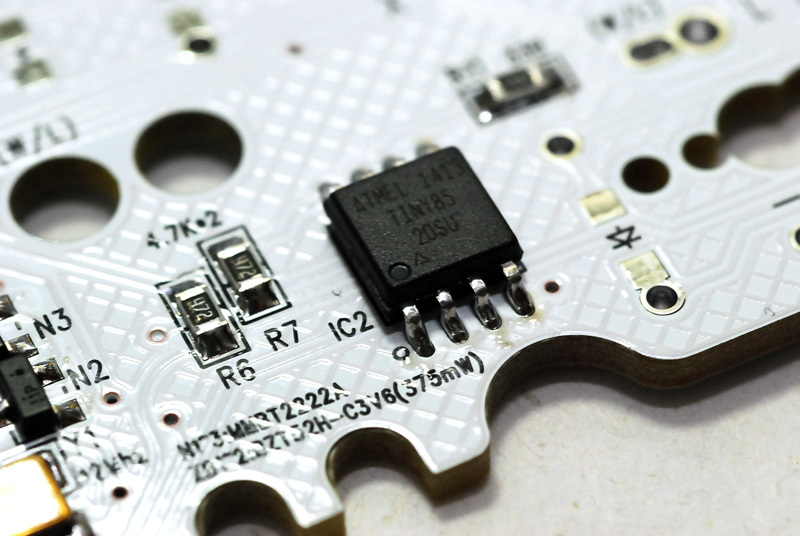 Recently the soldering points for a crystal were changed from 4 points to 2 points. 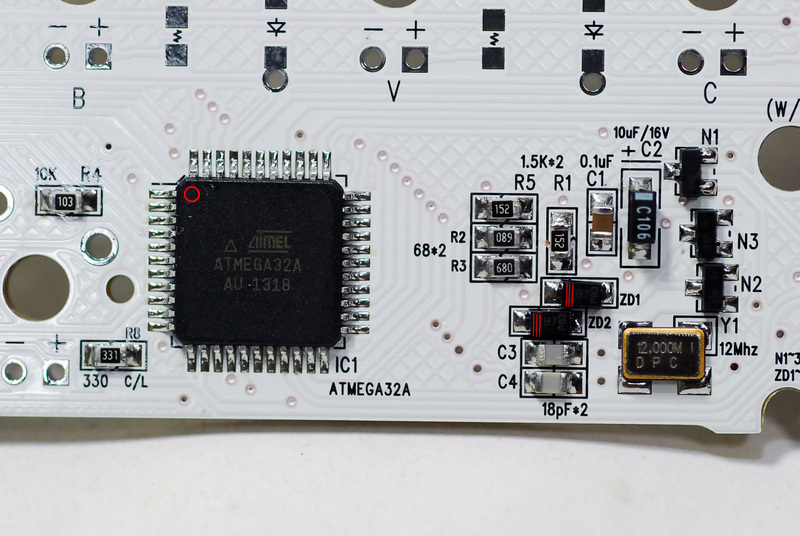 Have to add it in a diagonal direction soldering only 2 parts as the pic below. Anyway other parts look like this. 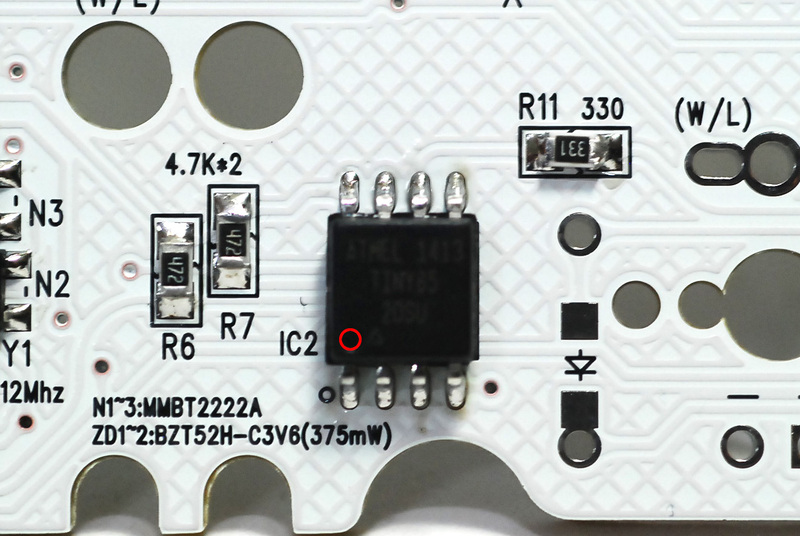 The pic above shows the RGB LED controller parts. Resistors have no direction, but IC2 has. RGB LED has the direction. 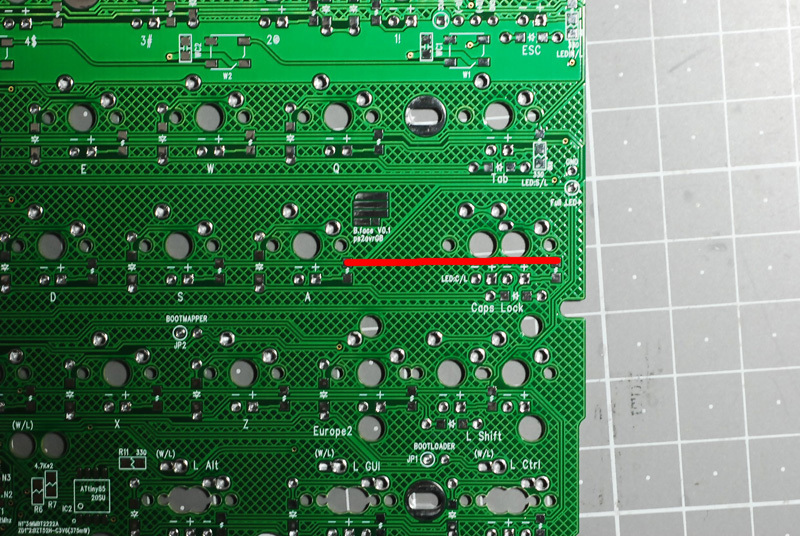 On the pcb and RGB LED, you can find a diagonal line at the corner which shows RGB LED direction. WC1, WC2, …. mean the capacitory. You can ignore them. Diodes have the direction. You can tell them by the black line. Purple line means the power line. Green line is showing the line to the LED. 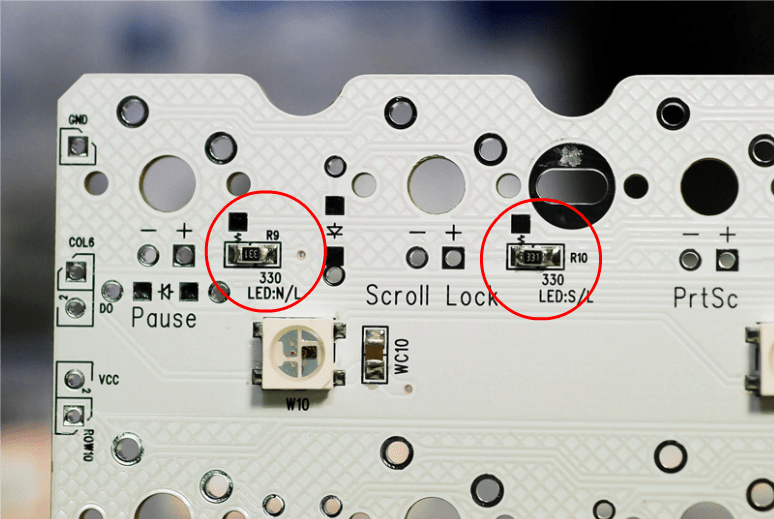 You can use Scroll Lock and Num Lock key as full LED. 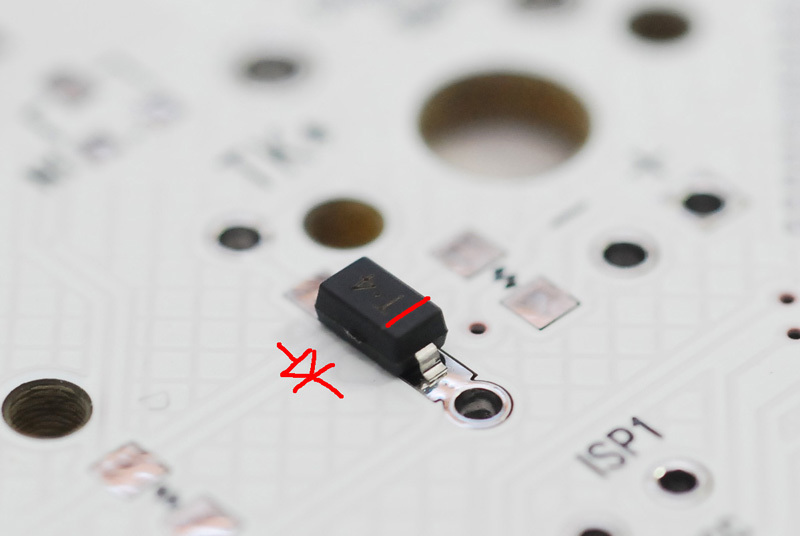 If you solder them like the pic(horizontally), they act as indicators. If vertically, as full LED. Solder a resistor for full LED at CapsLock. 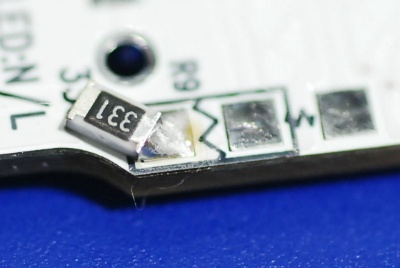 When you solder USB connector, please be careful not to overflow the lead. 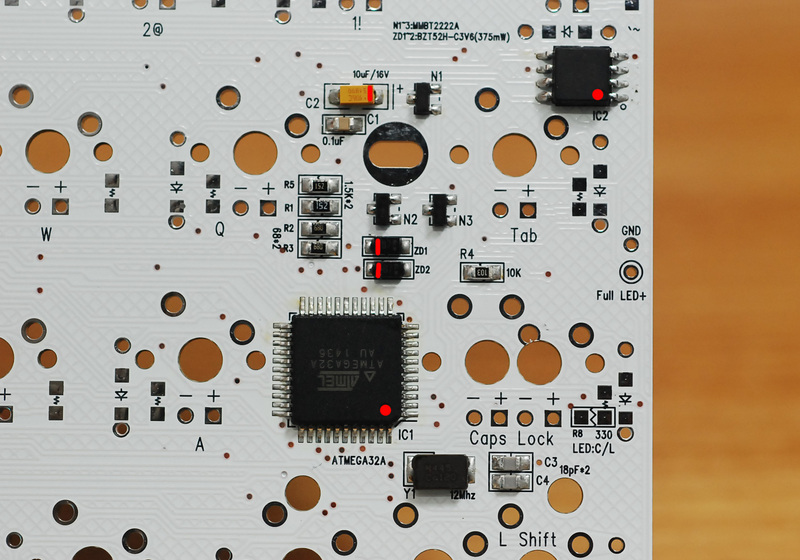 When you have finished soldering, you should upload the firmware by using BootMapperClient tool, and set the keymapping and RGB value. 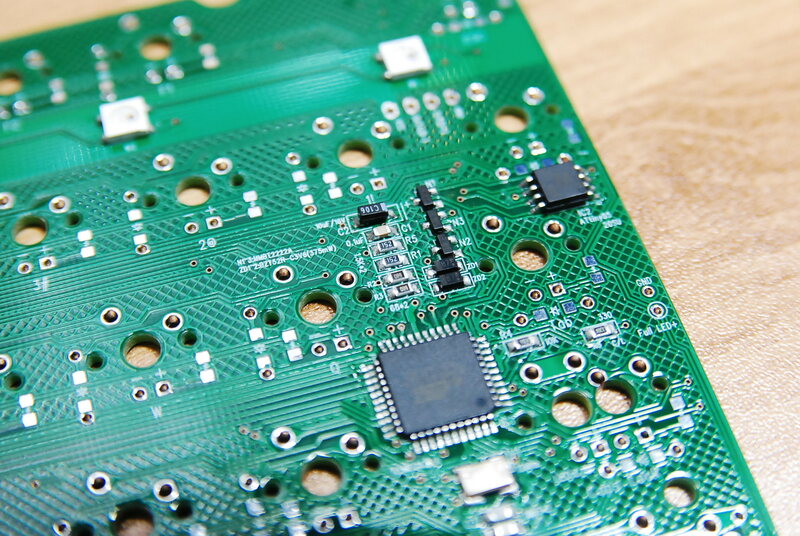 Q. I received PCB and found some incompletedly soldered resistors. Are they wrong? A. 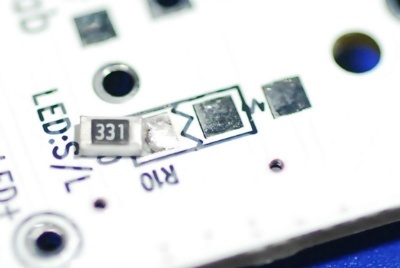 Around lock keys, you can find 330ohm resistors half soldered. We added them, so you can use them when you need. Usually 330ohm is used for Indicators while 820ohm for white LED. 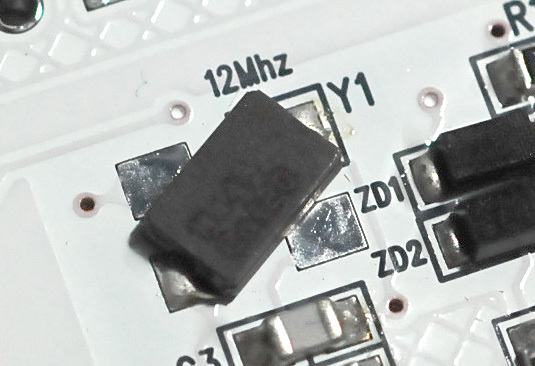 if you use 330ohm for full led, it will cause electric problem.